1. 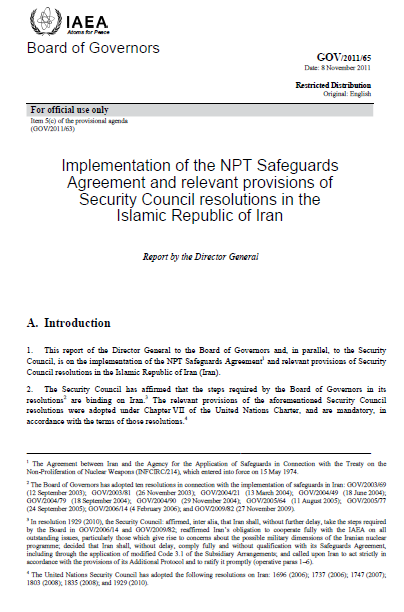 This report of the Director General to the Board of Governors and, in parallel, to the Security Council, is on the implementation of the NPT Safeguards Agreement and relevant provisions of Security Council resolutions in the Islamic Republic of Iran (Iran). 38. Previous reports by the Director General have identified outstanding issues related to possible military dimensions to Iran’s nuclear programme and actions required of Iran to resolve these. Since 2002, the Agency has become increasingly concerned about the possible existence in Iran of undisclosed nuclear related activities involving military related organizations, including activities related to the development of a nuclear payload for a missile, about which the Agency has regularly received new information. 39. The Board of Governors has called on Iran on a number of occasions to engage with the Agency on the resolution of all outstanding issues in order to exclude the existence of possible military dimensions to Iran’s nuclear programme. In resolution 1929 (2010), the Security Council reaffirmed Iran’s obligations to take the steps required by the Board of Governors in its resolutions GOV/2006/14 and GOV/2009/82, and to cooperate fully with the Agency on all outstanding issues, particularly those which give rise to concerns about the possible military dimensions to Iran’s nuclear programme, including by providing access without delay to all sites, equipment, persons and documents requested by the Agency. Since August 2008, Iran has not engaged with the Agency in any substantive way on this matter. 40. The Director General, in his opening remarks to the Board of Governors on 12 September 2011, stated that in the near future he hoped to set out in greater detail the basis for the Agency’s concerns so that all Member States would be kept fully informed. In line with that statement, the Annex to this report provides a detailed analysis of the information available to the Agency to date which has given rise to concerns about possible military dimensions to Iran’s nuclear programme. 41. The analysis itself is based on a structured and systematic approach to information analysis which the Agency uses in its evaluation of safeguards implementation in all States with comprehensive safeguards agreements in force. This approach involves, inter alia, the identification of indicators of the existence or development of the processes associated with nuclear-related activities, including weaponization. 42. The information which serves as the basis for the Agency’s analysis and concerns, as identified in the Annex, is assessed by the Agency to be, overall, credible. The information comes from a wide variety of independent sources, including from a number of Member States, from the Agency’s own efforts and from information provided by Iran itself. It is consistent in terms of technical content, individuals and organizations involved, and time frames. • Work on the development of an indigenous design of a nuclear weapon including the testing of components (Annex, Sections C.5–C.12). 44. While some of the activities identified in the Annex have civilian as well as military applications, others are specific to nuclear weapons. 45. The information indicates that prior to the end of 2003 the above activities took place under a structured programme. There are also indications that some activities relevant to the development of a nuclear explosive device continued after 2003, and that some may still be ongoing.